It shouldn’t be a surprise that most online or multichannel retailers sell more during the ecommerce holiday of Q4 and the early weeks of Q1 than any other time of the year — often doubling revenue from the other three quarters combined. The Holiday Season is “make or break” for many businesses, both big and small. If you’re reading this, you’re on the Internet, where now 13% of all retail sales are occurring (an all-time high), so it may not be a surprise for you. But why do so many marketing, ecommerce, retail and digital teams wait until the last minute to plan? Because, let’s face it — It’s hard. Picture a marathon race. While you may be able to muddle through it in pain without much training, if you started to train weeks or months in advance, your chances of having a better race increases. This is the same for your holiday retail season. 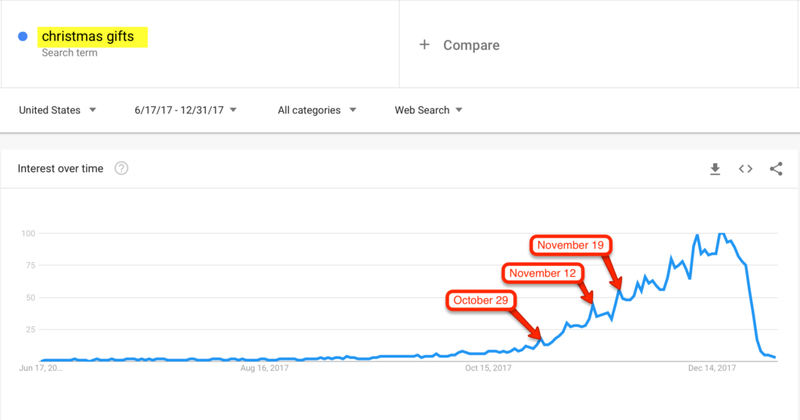 The reality is you need to be ready before the season starts because your customers are searching for gifts as early as mid-October, but ramp up exponentially as we roll into November. 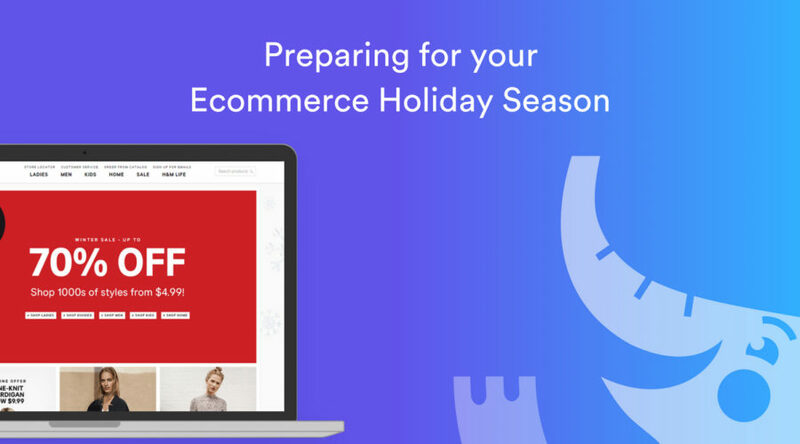 When does the eCommerce Holiday start? Experts agree. When the Starbucks’ “red cup” appears, the Holiday season has begun. This is typically the first Thursday or Friday in November and runs through the first two weeks of the new year. These 8-10 weeks are paramount to have a firm strategy in place in which to execute your sales. One thing to prepare for, which may not always be under the purview of the ecommerce team, is coordination with the Customer Service staff. Extended hours or new open days (Saturdays and Sundays) should be conveyed to all employees and then to your customers. List these hours in your emails and change the information on the contact pages. 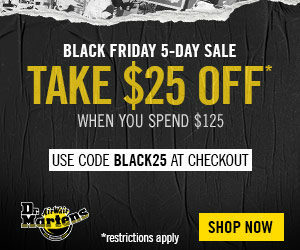 Also, be sure to find out the last potential shipping cut off day/time for delivery before Christmas Eve. I always would add a one-day buffer to be sure. Work with your distribution center or 3PL to determine the last time they need to receive an order for it to arrive in time. This may differ than the customer order time. For omni-channel organizations, your touch points may very well exceed just your own ecommerce commerce. Retail stores, with their point-of-purchase, table tops, or window displays, will need to be consulted and their collateral prepared and printed, sent to stores with plan-o-grams. It’s not uncommon for stores to not align with ecommerce deals these day, in hopes that different deals (or deeper discounts) will draw more customers into the store, especially on Black Friday, so be sure to align with the head of retail and their team. Similarly, your digital wholesale channels, such as Amazon, may be permitted to offer sales of their own. Aligning here will be extremely important to the business as a whole — because your customer may not care where they’re purchasing your product. Holiday campaigns in eCommerce are typically their own beast. As your products during the season may include sale items, new seasonal products, limited “Holiday-only” products, carry-over products and more, you’ll perhaps be utilizing thematic holidays ads rather than strict product marketing tactics. Because of this, you’ll want to understand how these ads perform over your regular marketing campaigns. Whether you pause your normal campaigns to use solely Holiday ads, or ad Holiday ads to your existing fleet of advertisement, tagging them with UTM codes slightly differently (probably by Campaign) enables you to compare data between products, ads, sources, and even seasons (last year’s Holiday ads versus this year’s). You may have a season-long ad campaign for your Gift Guide (below, left) but a specific ad for Black Friday (below, right). 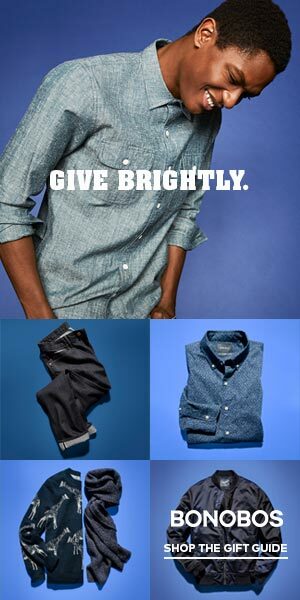 I’ve been at businesses before and after the advent of “Grey Thursday” — that is, Thanksgiving Day. 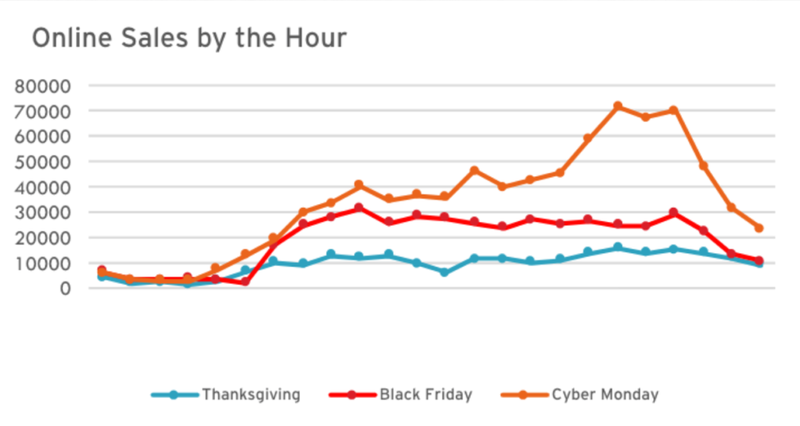 While once the idea of shopping on Thanksgiving was unheard of (even online), the burgeoning growth of ecommerce and the popularity of long days of sales have contributed to the birth of the 5-Day Sale, at minimum. Theses days (Thanksgiving, Black Friday, Saturday, Sunday and Cyber Monday) combined can be worth more than any single month throughout the year. The popularity of starting to shop online on Thanksgiving Day has increased the last number of years. But this has a trickle down effect as well. Orders, not typically shipped on Thanksgiving, pile up on Friday for your fulfillment center, as do calls for Customer Service. Can the site handle it? Test your site can handle the volume of traffic (or surges in traffic at particular times) by using a site like LoadImpact or others. This will help determine if you need to spin up new servers in advance of holiday promotions or day-part your emails throughout key selling periods to avoid overload. If you are in need of performance optimization, read our guide on how to break down performance into 4 big buckets. The growth of mobile has continued to burgeon the last few years, contributing to the demise of tablet visits as smartphone screens have become larger. This, coupled with Google’s view of Mobile sites, means your mobile site needs to not only be SEO friendly and have great UX for the customer, but just as fast as the desktop version. Remember, too, that while on Black Friday you’ll have more mobile price shopping (from customers walking around retial stores), you have a great number of desktop buyers when they return to they offices and desks on Cyber Monday. Prepare for both. Add beacons to track and promote to your customers in a geo-fenced area around your stores. Offer flash deals on mobile platforms for Friday and the weekend, etc. Kyle is a former magazine editor with a focus on the fashion, outdoor and sports industries, he brings a unique blend of design, sales and digital best practices to the table.